After an initial exploration on Lionel Messi’s right thigh, the reports suggest that the Barcelona player suffered a muscular injury that doesn’t seem serious. Lionel Messi is Barcelona’s safety method this season, the club simply doesn’t function equally when he is not on the pitch and the matches at Leganes or Sevilla are proof of this statement. The Argentine forward scored the two goals during the 2-2 draw against Valencia on Saturday and essentially saved the result for the Catalan club, but there was a sudden moment during the second half that completely silenced Camp Nou Stadium as Messi was getting medical attention on the sideline. The doctors were massaging his right thigh repeatedly, it was evident that Messi was having problems and this prevented him from playing better during the final 30 minutes of the second half. Right after the match ended there was major concern about Lionel Messi’s left thigh, the club reported that the player doesn’t present any type of major tissue tear and he won’t be taking any additional tests because they confirmed it’s nothing serious. 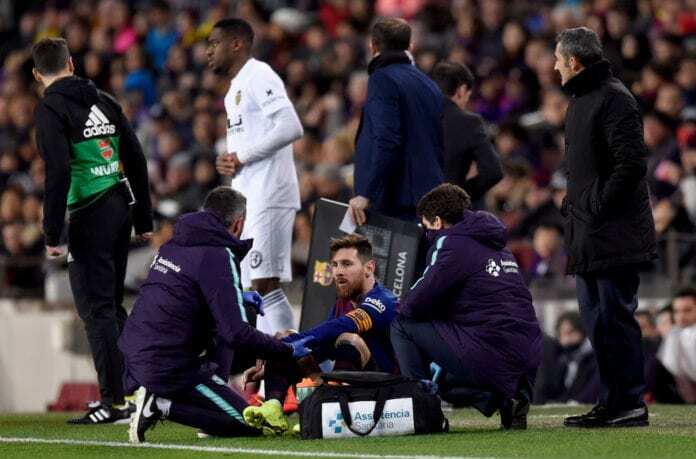 However, the images from the injury are very different to what the club told the media, there is actually a concern in Messi and his teammates as well. 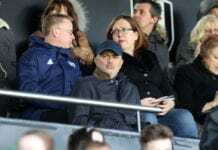 Manager Ernesto Valverde even refused to confirm anything, but the club rushed to calm everybody about the situation with a medical report. The initial report from Diario Sport came through ‘LaTdT’ from Catalunya Radio, it talks about Messi only suffering a contracture on his left thigh and the doctors don’t believe it will be any more serious than that. But we need to understand how important it is having Messi in the best possible shape this month, the Catalan club will have to play three matches against Real Madrid after last week’s Copa del Rey semifinal draw took place. The Catalan club has already suffered without the Argentine player, there is literally no one in the club who can replace what he does right now and this puts things in perspective for FC Barcelona. It was just last week when everything seemed perfect and the world thought the Catalan club was going to compete for all the trophies, the constant calls to action for the club’s chances to win another treble have been non-stop since the season started. But make no mistake, FC Barcelona has no chances of winning anything if Lionel Messi is not on the pitch. Today he proved it once again after scoring another two goals, he has now reached 21 goals in La Liga this season and he leads the Golden Shoe table throughout Europe. After the match, another player who spoke about Messi’s problem was Ivan Rakitic as reported by Diario AS. “We weren’t able to get where we wanted. The first half hour wasn’t the best for us but there was a moment in which we kind of seemed to be playing handball,” siad Rakitic after the match. After the report was made for Messi’s thigh, the club decided to not run tests right now but possibly contemplate the possibility for next Monday. El Clasico is coming on Wednesday and the Catalan club simply can’t afford not having Messi for this match, which will be played at Camp Nou. What do you think could happen if Lionel Messi misses next week’s El Clasico due to injury? Please share your opinion in the comment section down below.